Preheat the oven to 220C, gas mark 7. Slice 4 sweet potatoes into 1cm rounds. Toss in a bowl with 1 tbsp essential Waitrose olive oil, 2 garlic cloves, bruised, and 1 tsp coriander seeds; season, then transfer to a roasting tray and cook for 30 minutes, turning after 15 minutes. Heat a griddle pan to medium-high. Brush 4 essential Waitrose British chicken breasts with ½ tbsp olive oil; season and cook for 7–8 minutes on each side. Meanwhile, mix 100g essential Waitrose low fat natural yogurt with 1 garlic clove, crushed, the juice of ½ lemon, ¼ tsp cayenne pepper and 1 tbsp chopped mint. 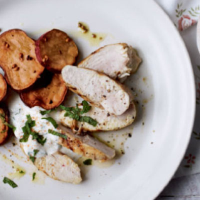 Season and serve with the chicken and sweet potatoes.